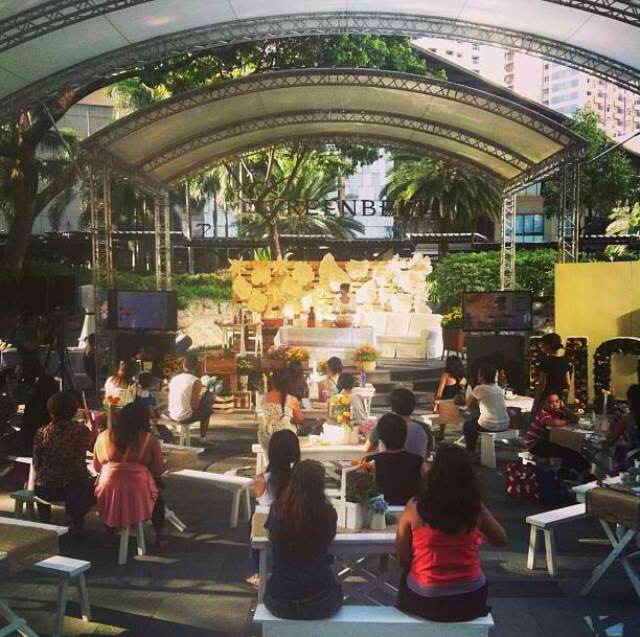 I had a fantastic time giving a condensed version of my Juice Up, Smoothie down workshop in yesterday’s Mommy Fair hosted by Greenbelt. The Greenbelt 3 Park was dressed quite lovingly, as if you wanted to have a cup of tea and cookies with your girlfriends despite the 36 Celsius heat. Check out photos at Greenbelt’s Instagram account. 1. Eat your fruit and veggies. 2. Drink your fruit and veggies. 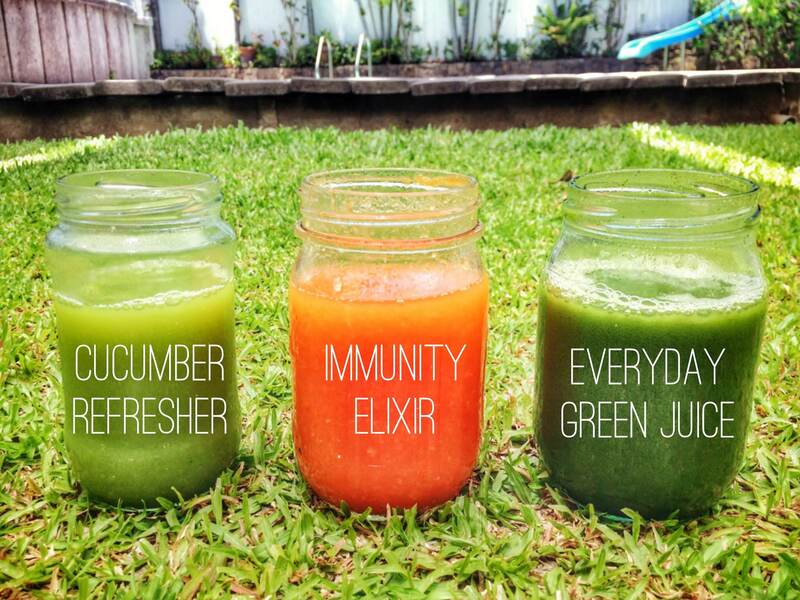 Here are 3 juice recipes and 1 green smoothie recipe to kickstart your journey to a cleaner, more alkalised, more inner-peaceful you. Juices need a juicer while the smoothie needs a blender. I normally don’t post photos of classes on the blog because I’m more active on Facebook… But I decided to post what we’ve cooked in class so far this year, for all you non-Facebook users (and for those who don’t know we exist on Facebook). As usual, all dishes cooked in class are whole foods, plant-based, nutrient-rich, and gluten-free friendly. 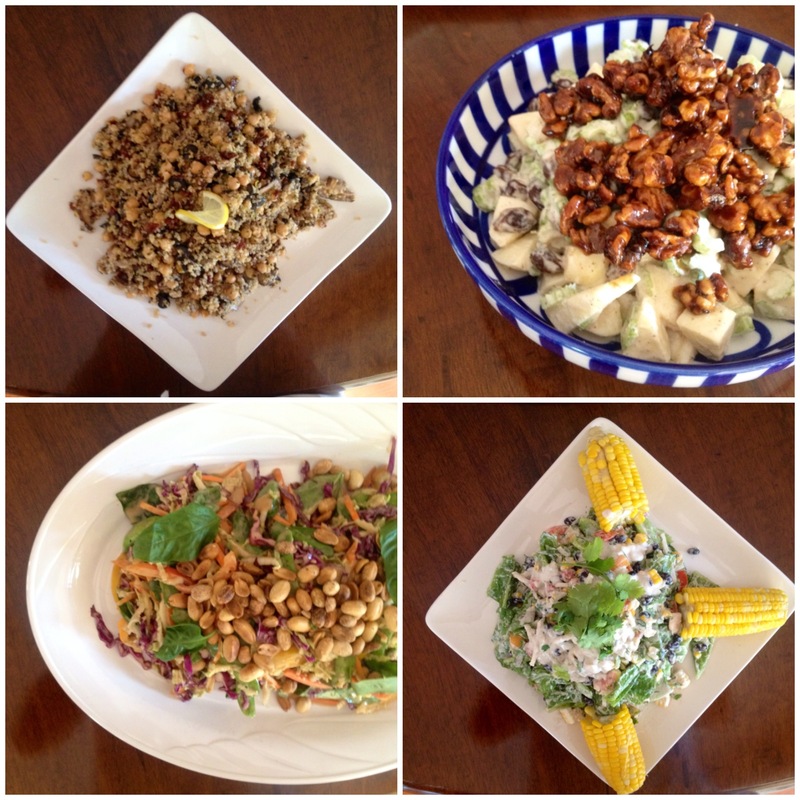 Some photos of the dishes cooked in this past month’s classes. Always a pleasure to share creative ways in preparing fresh vegetable-based dishes! 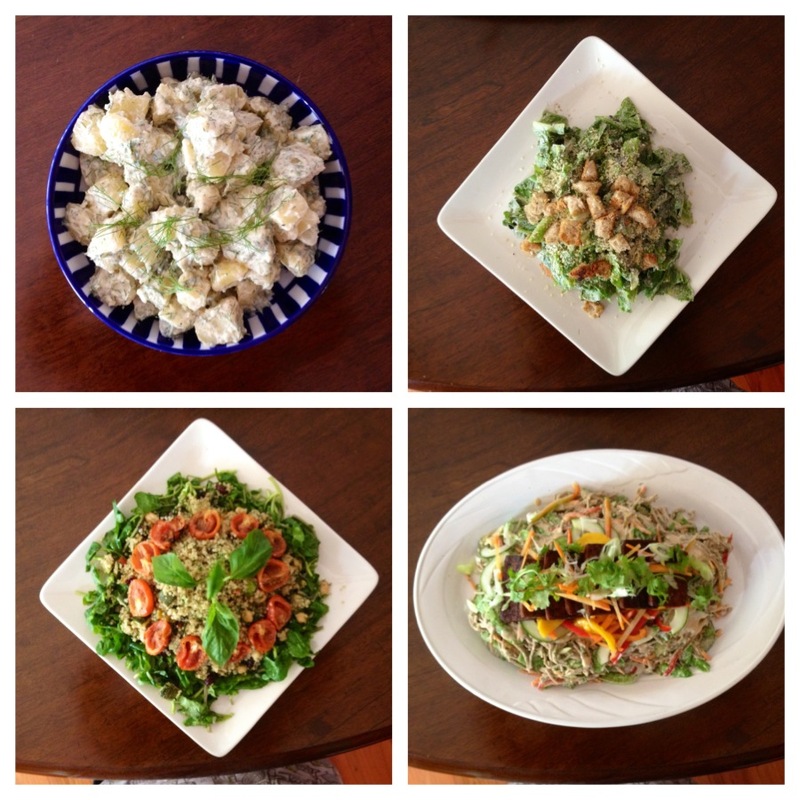 Clockwise from top left: garlic-dill potato salad, Caesar salad with almond parmesan and garlic croutons, soba noodle salad with miso tahini dressing and tofu, chickpea-quinoa salad on watercress with basil-lime vinaigrette. Fabulous sandwiches – no meat but with tons of flavor. 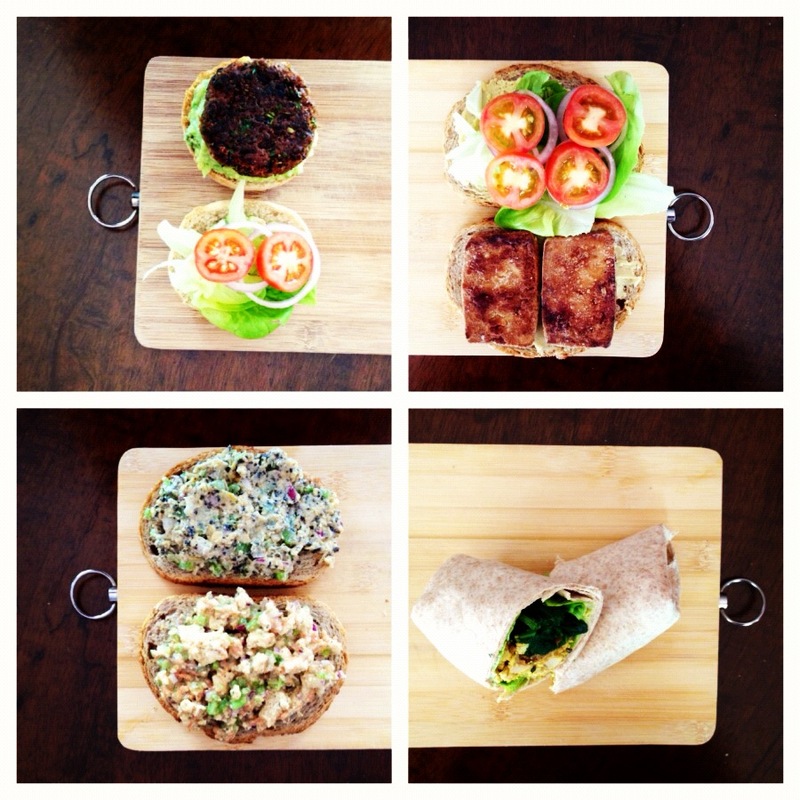 Clockwise from top left: black bean sliders with guacamole, smoky TLT (tofu, lettuce, herbed tomatoes) sandwich, breakfast burrito (with vegetarian sausage and tofu scramble), tu-no salad sandwich, un-chicken salad sandwich. A cuisine close to my heart and my belly. 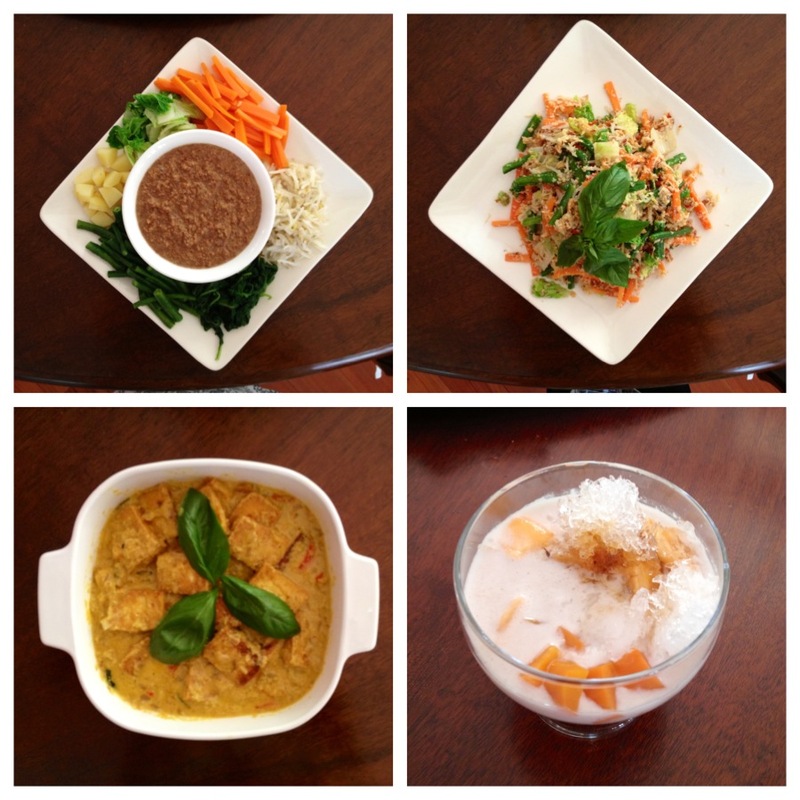 Clockwise from top left: gado gado (salad with peanut sauce), sayur urab (Balinese mixed vegetables with spiced grated coconut), es teler (fresh fruit in coconut milk), sambal goreng tahu (Indonesian tofu curry). Because you can’t spell sosyal without sauce. 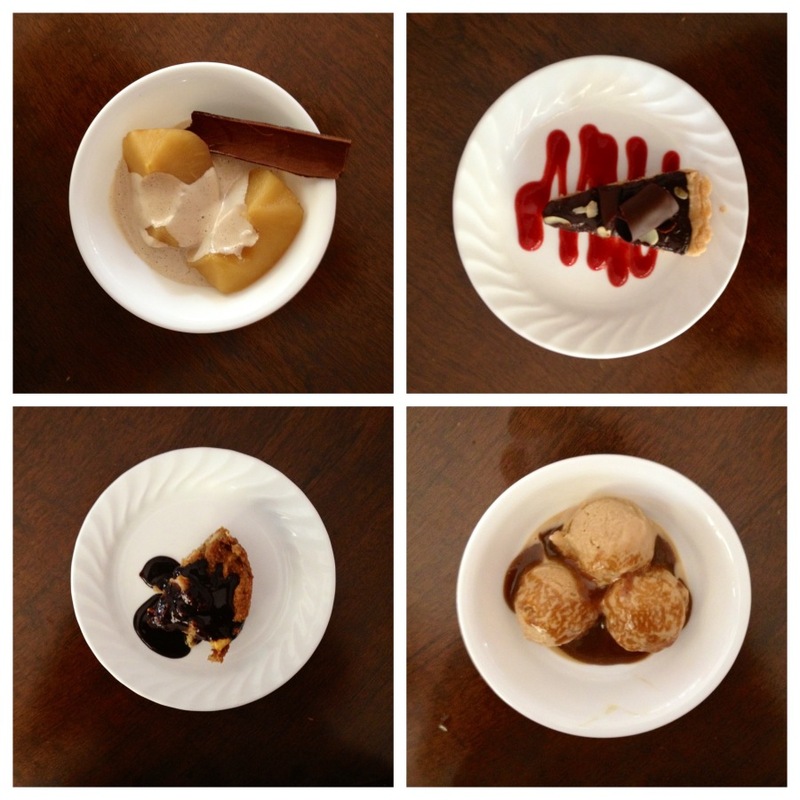 Clockwise from top left: poached apples with vanilla bean creme anglaise, whole wheat dark chocolate tart with berry coulis, coffee ice cream with salted caramel sauce, banana bread pudding with chocolate sauce. Watch out for more amazing classes coming this month! 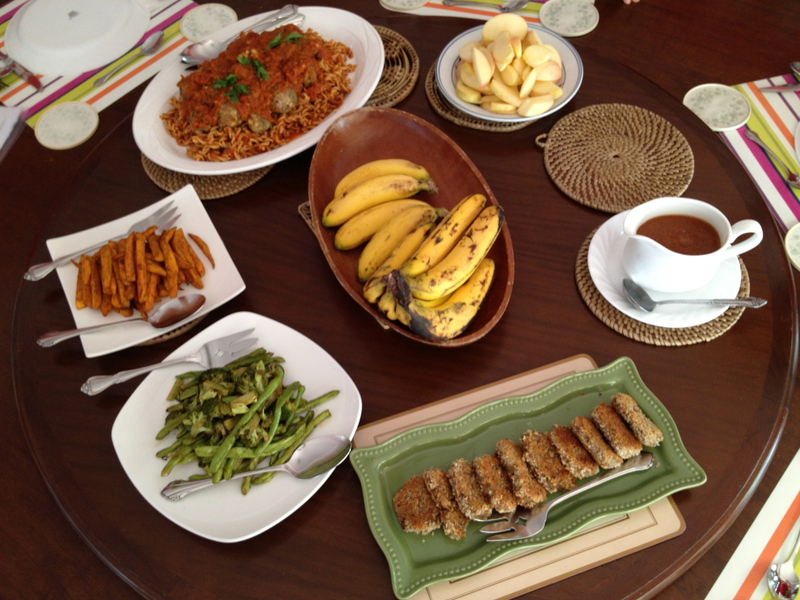 Some photos of the dishes cooked in the past 2 months’ classes. Some classes were postponed either due to bad weather or lack of students, but we pretty much covered a good number of dishes! I’ll be on holiday break for a month. Next class will be on the 15th of September. Stay tuned for the schedule of September classes. I can’t begin to describe how awesome that day was. 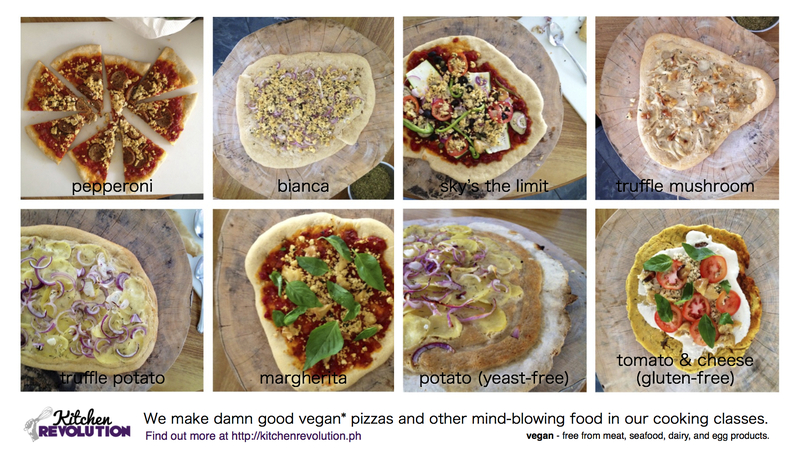 I think Manila needs a vegan pizzeria, stat! The Facebook interwebz practically imploded when I posted sneak peeks of these dishes. 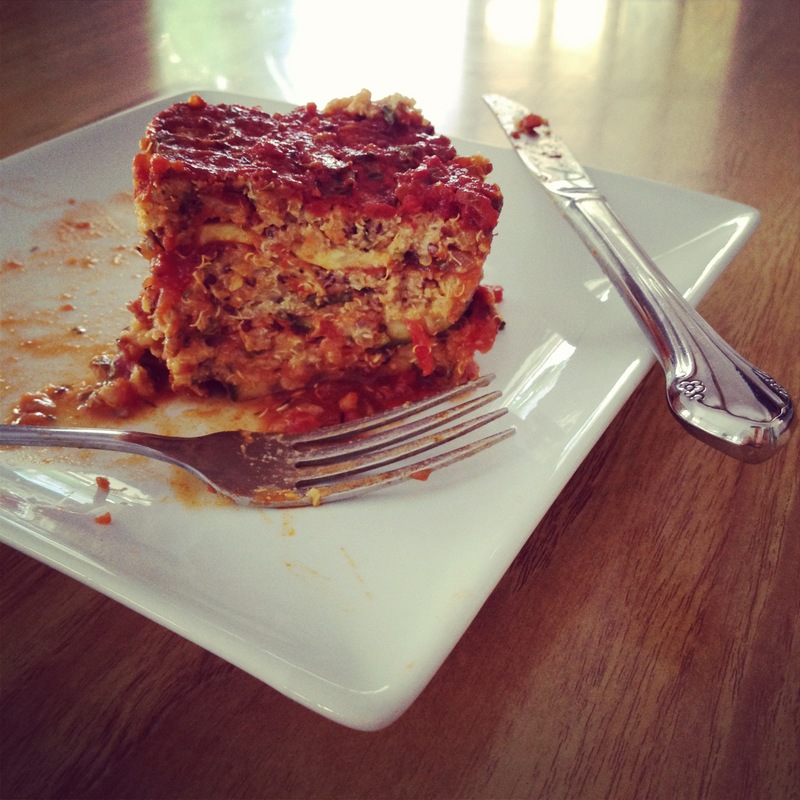 Salad of spinach, quinoa, and mushrooms; Moroccan stuffed peppers; black bean and quinoa croquettes with avocado sauce; vegetable lasagna. Some photos of dishes cooked up in class last month. All in Alabang! 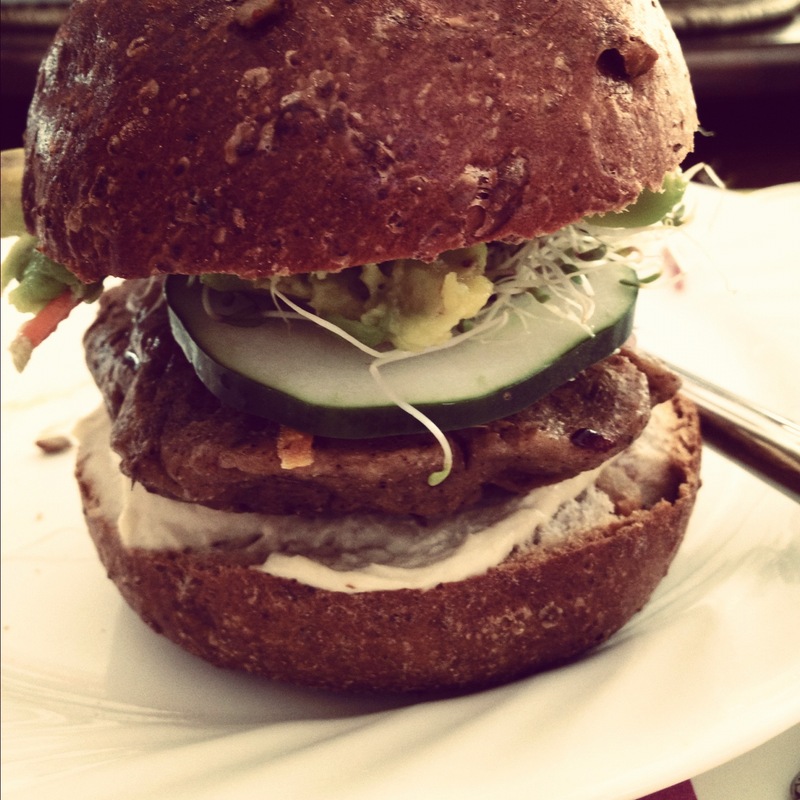 This one’s made of kidney beans with avocado, cucumbers, sprouts, housemade ketchup, and vegan cream cheese. 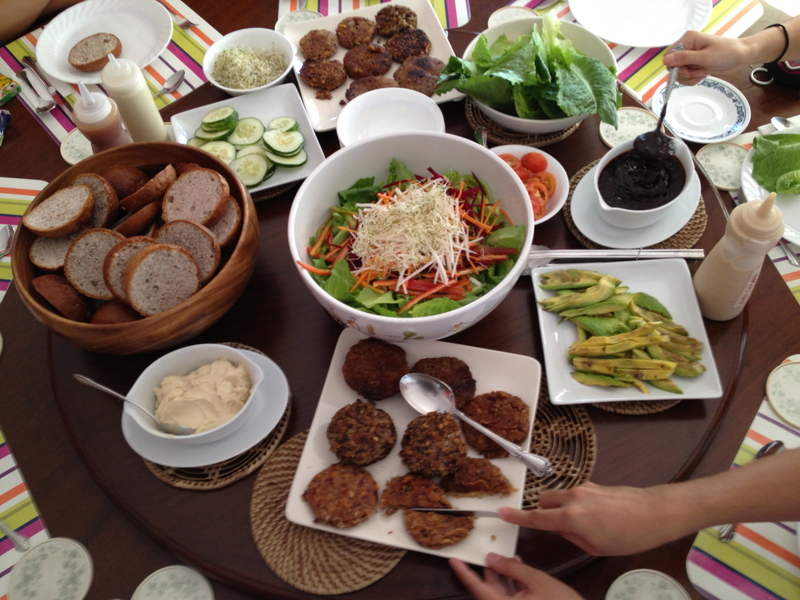 We made a total of 4 kinds of burgers: bean, tofu, mushroom, and seitan / gluten. We also made these sauces from scratch: barbecue sauce, ketchup (no artificial food coloring or preservatives! ), egg-free mayo, and dairy-free cream cheese. Large colorful salad with miso sesame dressing too so we wouldn’t get too carbed out. Clockwise from bottom: chickpea croquettes with supernatural ketchup, barbecue-spiced vegetables, whole wheat fussilli with tofu meatballs and stealth tomato sauce, apples to go with the cookie dough hummus (not in the photo). Get schooled this June in burgers, Greek food, pub food, raw food, green juice, pies. Full menu here. Well hello there. I know I should’ve posted this recipe last week but I spent last week doing major R&R after a packed summer. How have you been? Knife skills faster than a speeding bullet? 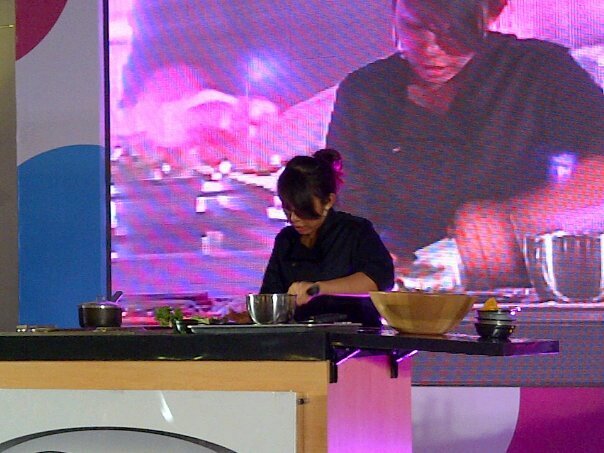 So in case I haven’t talked about it enough, I conducted a vegan cooking demo at Yummy Magazine‘s fabulous food fair last May the 26th in Rockwell Tent called Yummy Eats. It was pretty packed. My face appeared on the big screen which I did not expect. My team and I prepared enough samples for a small army. I was slightly nervous but I was comforted by the fact that I get to share my vegetable nerdery with people who don’t necessarily make vegetables a priority in their diet. Lots of good food went around – mostly omnivorous. There were 2 vegetarian tables, though. Wabi’s table. 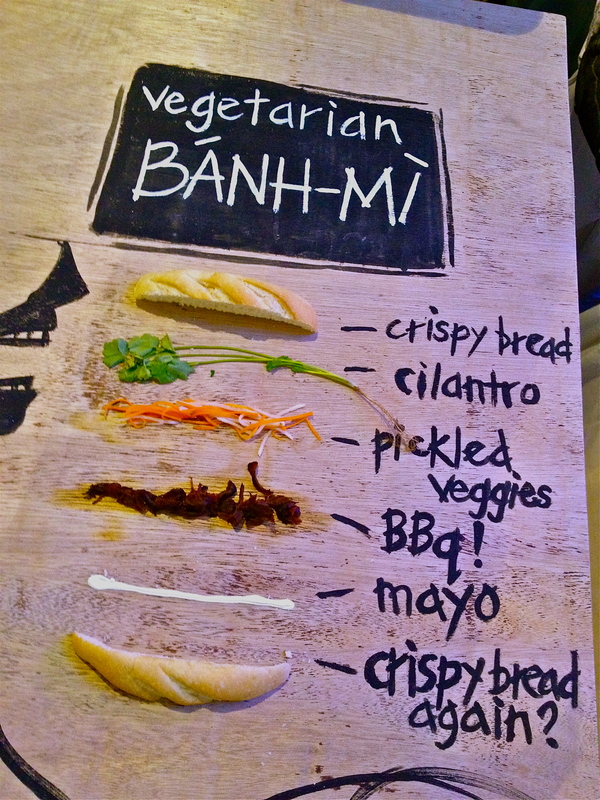 Their banh-mi is reaaaally good. They have egg-free mayo on hand, too. Wabi Sabi Noodle House and Vegetarian Grocery had a pretty artistic table (they won the award for best design) and gave out samples of vegan chicharon. Their kuapao sandwich rocked, too. Pipino Vegetarian had a booth as well and gave out free samples of vegan mac and cheese and Cuban grilled corn. The vegetarian love is slowly growing! 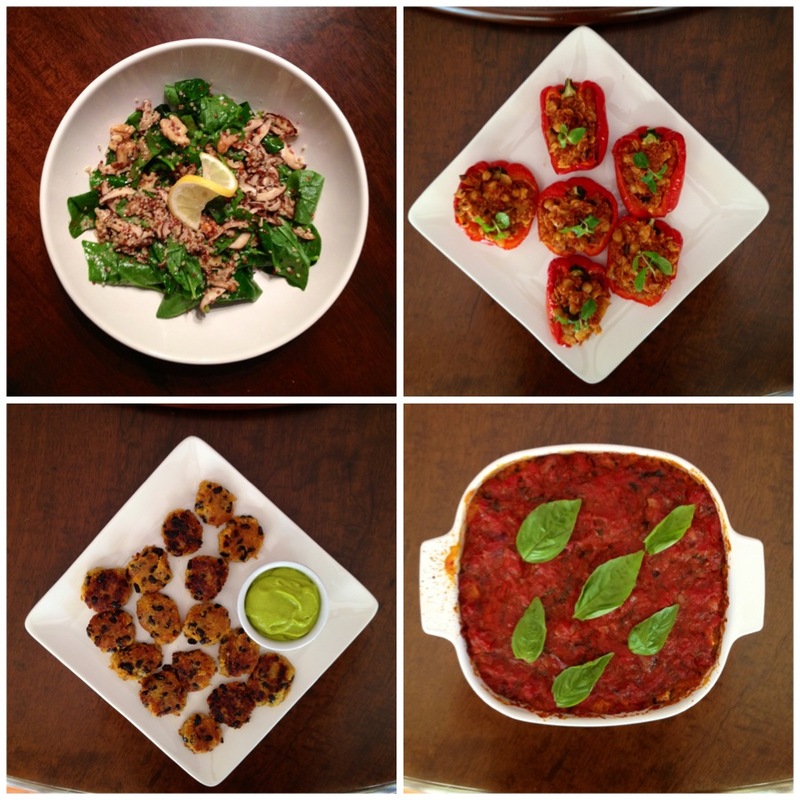 I made 3 dishes for the demo and I promised folks I would post the recipes on my blog. I’ve decided to post them in 3 parts. Part 1, here we go.